Magento Social Commerce Script by Plumrocket Inc allows your customers to enhance your store by sharing & liking your products, and adding their own ideas. Utilize the best magento social media extensions to make your store look more lively. 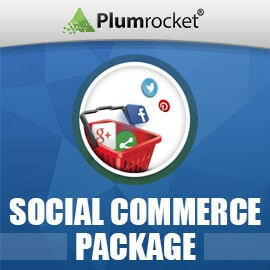 Magento Social Commerce Package comprises of three social media oriented extensions from Plumrocket Inc. The Live Feed extension is the best solution to show what your site customers are currently buying and socially sharing. The Faves plugin will let you add a custom social media button called "Fave", as well as Facebook Like, Tweet, Pinterest and Google Plus to your Magento store. Finally, the Inspiration Wall Magento Extension will convert your store into a Magento social network by letting your customers upload photos of their product-ideas to your store, share and discuss them with other members, thus creating a brand new quality of membership site environment. Socializing your online store today is important. I decided to do so and using this pack brings me no regrets so far. Plumrocket support is nice and helpful if I ask something. Thankful for this purchase. Jamie. help in case you have any problems. One other thing - make sure to read the documentation they have with the products - it helps save time later. Cheers! After the installation extension is disabled by default allowing the site owner to enable extension when necessary and not when it is installed.